When it comes to aesthetics, it’s hard to beat a log or timber-framed home. With a European history that dates back 800 years—with some of those structures still standing—they’re pretty much guaranteed to fit the land, given that their organic building material is derived from their natural surroundings. Consequently, the structures seamlessly meld into the topography like a toad in a leaf pile. 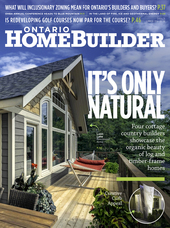 Although dating back just 150 years, Ontario’s log homes similarly showcase that remarkable durability. Based on a style and technique borrowed from the Scandinavian settlers along the Delaware River south of the border, the province’s first log homes were simple structures hewn from surrounding forests by Ontario’s first European visitors. Small and functional in design, measuring about 15’x16’ (the traditional dimensions of an English cottage), these homes were meant to be temporary residences, sheltering families from the extremes of Canadian weather. Only a handful of carefully preserved log homes can still be found today in locales across Ontario, including Westfield Village in Waterloo County, at Upper Canada Village in Eastern Ontario and in Prince Edward County. But the fact that some still exist (not to mention the hundreds more that have been demolished or disassembled over the years) is a testament to the staying power and enduring appeal of timber. Today’s log, timber-frame and log/timber hybrid homes are a far cry from the simple pioneer structures built by our forefathers. They offer rustic elegance, the warm ambience of natural wood, technological innovation, energy savings and environmental sustainability since they are built from a renewable resource. and timber-frame packages are shipped across Canada, to 23 U.S. states, England, Italy, Spain, Germany and Japan. Kinsman points out several features of Confederation log and timber frame homes that make them winners in environmental sustainability. All of the timber comes from select Canadian suppliers that are Forest Stewardship Council (FSC) certified, meaning that their forests are well managed. Compared to conventional homes, log and timber frame construction offers superior insulation values and excellent ‘thermal mass’ attributes. Logs absorb heat well and release it slowly. Kinsman compares this characteristic to the sawdust placed on ice in traditional icehouses to prevent melting. Confederation creates a complete 3D virtual walk-through, which shows customers every angle of their new home, inside and out. The home is pre-assembled at Confederation’s factory, allowing customers to inspect it before it is disassembled, shipped and re-assembled on site. When asked if remote customer sites such as islands pose a challenge, Rich Kinsman brushes off the question as a non-issue. “We’ve been doing this for so long that we’ve pretty much seen it all. No obstacle is a challenge,” he declares. By contrast to solid log, Kinsman adds that structural timber frame homes offered by Confederation—featuring post and beam and trusses—are “one of the most expensive ways to build,” For this reason, his company offers customers the option of using timber accents decoratively to save costs. James King, president of Discovery Dream Homes, can attest to the longevity of timber. Owning a 35-year-old log home that was built when he was a child, King recently sandblasted and refinished the home. “It was easy to do, and it looks like new,” he says. Discovery Dream homes, also headquartered in Bobcaygeon, is owned by a family that has been building log and timber-frame homes for over 40 years. According to King, 80% of Discovery’s homes, which use FSC-certified white pine from Northern Ontario and cedar and fir from the west coat, are built within 300 kms of its 12,000 sq.ft. production facility, with the remainder going the American west coast and overseas. After cutting, the Discovery home is assembled in its factory and thoroughly checked to ensure quality. It is then disassembled, watertight packaged and shipped to the site for builders to construct. Offering its customers log, timber-frame and hybrid options ranging from 1,200 to 5,000 sq. ft, Discovery home costs start from $325 per square foot, King notes. Linwood Custom Homes specializes in “hybrid” post-and-beam construction. With over 10,000 homes produced since the company’s inception, 24 homes chosen as finalists in the Canadian Home Builders Association awards (winning three times) and hundreds of home designs displayed on its website, the company’s designs feature true vaulted ceilings with mixed roof systems throughout the home to encompass truss, post-and-beam and timber frame elements. Near Sudbury, Bob Myers, owner of J. Robert Construction and Renovation, specializes in building log and timber-frame homes made from northern white pine. Over his 20 years in business, Myers has had his share of negotiating a myriad of remote Northern Ontario waterways in getting the job done. But such time off has been rare. 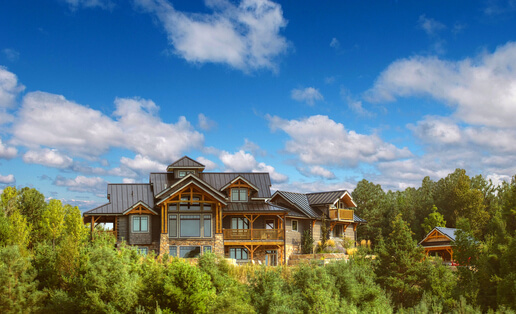 Noting the attraction of high ceilings, large windows, fireplaces and the use of “big round logs” of the fir variety, Myers has witnessed an uptick in demand for timber-frame homes over the past six to years. Extolling the thermal mass attributes of log and timber, Myers describes modern, energy-efficient improvements to traditional log building thanks to tongue-and-groove design with gaskets placed between the logs. It’s part of continuing a centuries-old tradition of manufacturing homes that, themselves, may stand for centuries. Knock on wood.